In the continual redefining of limits that characterizes the sport of cross country, the occasional big breakthrough causes a stir. 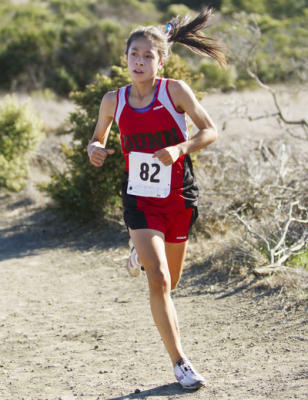 Such was the case with Gunn sophomore Sarah Robinson, who improved her best time on the Crystal Springs course from 18:48 to 17:32 at the SCVAL El Camino Division finals, then to 17:12 the next week in winning the Central Coast Section Division I race. Her winning time at CCS puts her among the top entrants in the girls Division I race at the state finals Saturday at Woodward Park in Fresno. Sarah is the younger sister of Erin Robinson, a former Gunn standout now at USC. What makes Sarah's breakthrough in cross country all the more noteworthy is that soccer is her main sport. Prior to her cross country league finals she took part in a training session for the U.S. Soccer U-17 National Team in Southern California. "It will be interesting to see how she balances the two,'' Tompkins said. "We have to keep her mileage low because every day she goes to soccer practice. Her time at CCS was the second-fastest time ever run at Crystal Springs by a sophomore. Aragon's Lauren Croshaw has had her own breakthrough this fall. Croshaw won her first CCS title, taking the Division II race in 18:05. The previous week she won the Peninsula Athletic League championship in 17:42, a time that broke the school record of 17:43 set by Nicole Portley. Croshaw ran 18:41 as a sophomore and 19:01 last year, in the rain. Milpitas junior Yohaness Estifanos had the fastest time of any runner at the CCS finals, winning the boys Division I race in 14:59 -- the first CCS runner this year to break 15 minutes. That time puts him among the top runners in Division I at state. Monta Vista's Kevin Bishop, the second-place finisher at CCS, could also do well at state. "Kevin is one of those guys who finishes well at the end of the season,'' Monta Vista coach Kirk Flatow said. Priory's Kat Gregory in Division V is another individual with an excellent chance of a top 10 finish. Based on performances at section finals, the CCS teams with the best chance of a top five finish are the Carlmont boys in Division I and the San Lorenzo Valley boys and girls in Division IV.